This past weekend, we took a trip with D's parents to a distillery. In fact, it is the only whiskey distillery in the state! 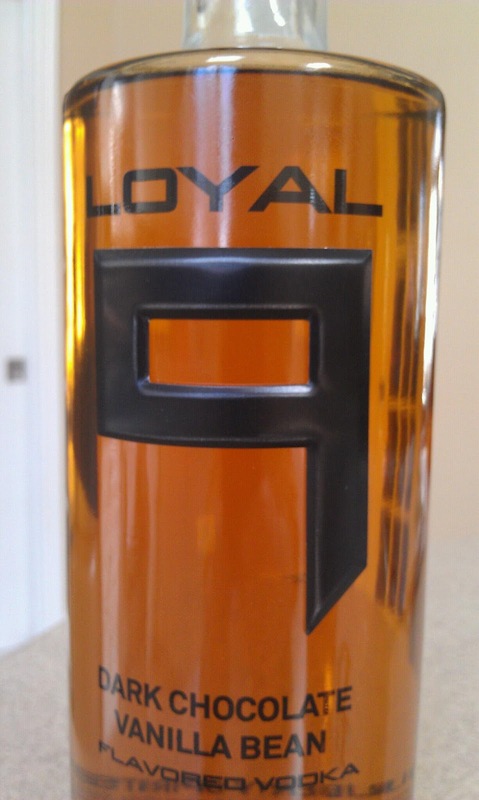 Sons of Liberty opened in 2011, and originally released a whiskey and they called it Uprising. D's dad had picked some up last summer for D's bachelor party, and it was such a smooth whiskey, and they really enjoyed it. So, when we first got to the distillery, we were greeted by Danny, who is the sales manager, but also does tours when he's not on the road. He showed us through the distillery, which actually isn't that big, but the key thing to it is that it is efficient. Danny explained that they make their whiskey from beer. He showed us the four types of hops that they use to brew the beer, and explained that the only difference between the four types is how long they are roasted, similar to coffee beans. 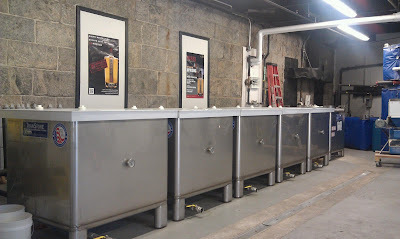 Next, he had us open up the lids to the holding containers, where the beer was fermenting. The first container had such a strong smell, almost like tequila, but that's because it hadn't been distilled a second time yet. The second container was really cool, because it smelled like beer, and you could actually see the active yeast on the top fermenting the beer. 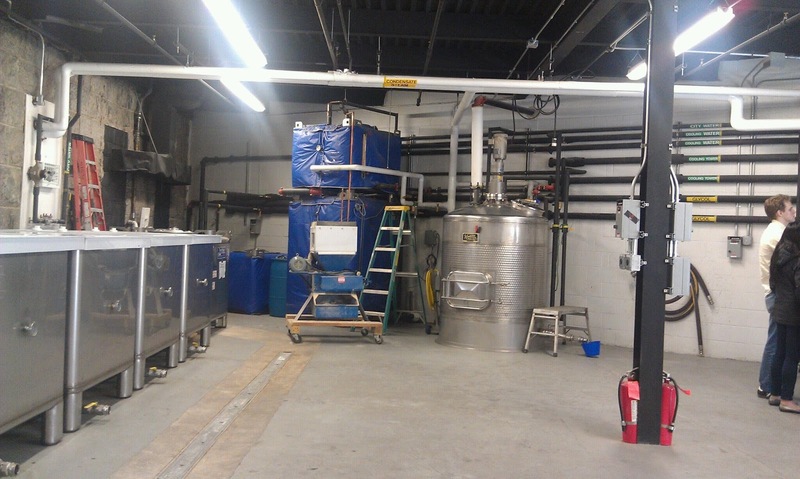 Next on the tour was the roasting pot, where they roast the hops to get the flavors that they want, and then add in the water to start the distilling process. 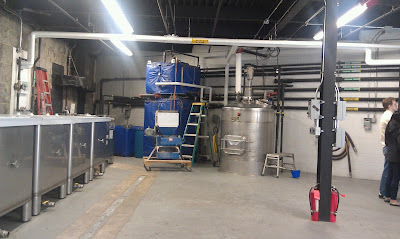 Next, we were shown the actual still where the whiskey is made. The thing is huge, and was custom designed by the owner of Sons of Liberty, Michael, and the company that he designed the still with is now selling them on the floor. As you can tell from the picture below, the still is large enough to actually get into, which they do every so often for cleaning. The four windows that you see on the pipe allow you to see the level of which the liquid is at, and there are gauges all over the different pipes so that they can read the levels of alcohol. 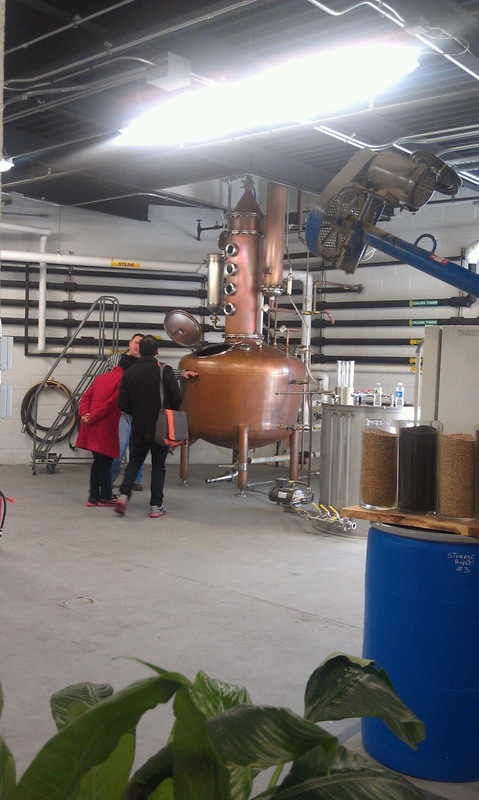 Danny also talked with us about how they make their vodka, which is done using the same machines that they use to make the whiskey. 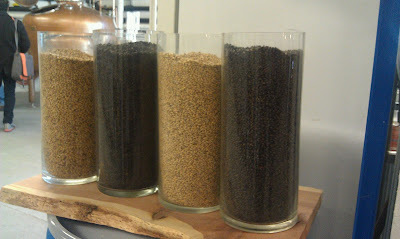 For their flavored vodkas, they use all natural ingredients and actually do all of the work themselves. One of their flavored vodkas is Mint Cucumber, and they sat around together and zested over 500 cucumbers by hand and de-stemmed mint leaves just to create the flavor. They were actually asking if we knew of any different cucumber recipes that they could use because after their zesting parties, they have all these unused cucumber cores and don't know what to do with them! After our tour was over, we went up to the bar to do the tasting. You may know that I'm not really a drinker, so I was unsure of how much I would enjoy the process. But, I really enjoyed it. The bartender, Brian, was great, and was so helpful in giving us information about the different spirits. We tried the Uprising Whiskey, which we had all already had before, and while it was too strong for my liking, since I don't really do hard alcohols, especially whiskey, it was smoother than others I have had before. We were also told about the different seasonal spirits that they make. Last year, they made a Single Malt Whiskey, and sold all 900 bottles that they made. 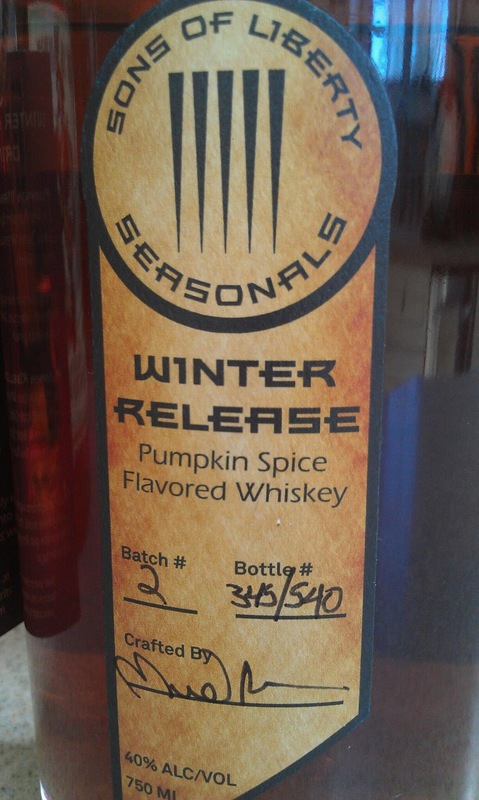 Another seasonal flavor that they created was the Pumpkin Spice Whiskey which was apparently also a really big hit. Danny, the salesman, told us that as of three weeks ago, there were only 4 bottles left in the state! 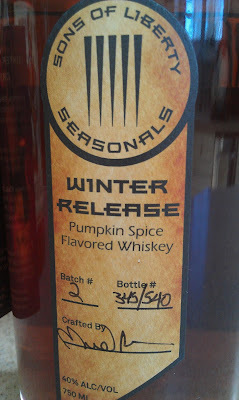 I was really looking forward to trying that one, since I love pumpkin, but they didn't even have a bottle for themselves! After the whiskies, we moved onto the vodkas. I'm not a huge fan of vodka, but I must say that I did really enjoy these. The regular vodka was strong, but still was good. The seasonal vodkas, however, were my favorite. The first one was the Mint Cucumber Vodka, which I mentioned previously. You really get a strong cucumber flavor at the first taste, but the after taste is where the mint comes in. It's such a fresh taste, especially for me not liking cucumber! Brian told us that making a mojito with this vodka would be perfect because of the mint, but would also add a little surprise in there with the cucumber flavoring. The second vodka was my absolute favorite! It's Dark Chocolate and Vanilla Bean Vodka. The smell of it is just so chocolatey, but the after taste is where you really get the vanilla flavor. Danny wanted us to taste it in a mixed drink, so he ended up taking some and mixing it up with Rum Chata, which is a Caribbean Rum with real Dairy Cream. When you originally smell it, it smells like carrot cake, which I just happen to love. The Rum Chata really brought out the vanilla flavor, and it was absolutely delicious! I loved it, and ended up taking D's too, since he's not a fan of carrot cake, and didn't really enjoy the combination. That was the last drink that we sampled, and our experience at Sons of Liberty was awesome. We will definitely be going back, because the staff and experience were awesome! 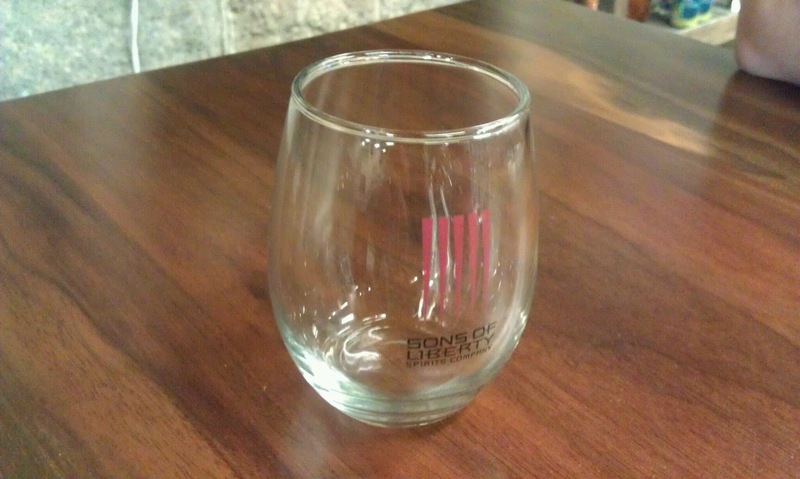 Part of the tasting was the Sons of Liberty glass, which has already gotten great use, because I went to the liquor store the next day and stocked up. 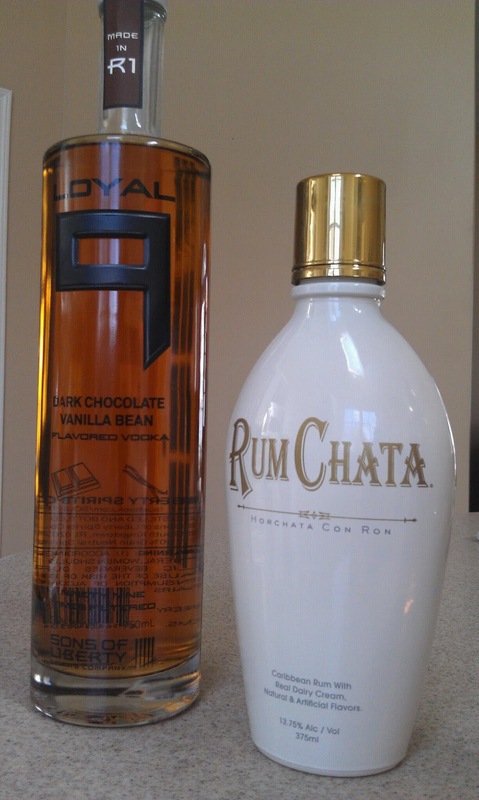 I got a bottle of the Dark Chocolate and Vanilla Bean Vodka, and a small bottle of the Rum Chata, so I could make my own drinks. While I was at the liquor store, I also walked over to the whiskey section and as I was browsing, I found the Pumpkin Spice whiskey sitting on the top shelf! We were told that this liquor store was one of the ones that still had it, but given that those numbers were accurate three weeks ago, I was skeptical that it would still be on the shelf. We really lucked out though! We ended up trying that one out too, and it was really good! I'm looking forward to Fall so I can enjoy some seasonal drinks with it. 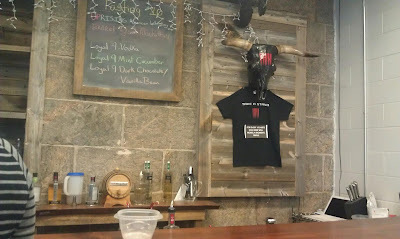 So that was our trip to the distillery. If any of you are local or will be traveling through the area, I highly recommend that you check this place out. I doubt that you will be disappointed. I have been excited to paint rooms since before the day we started looking at houses. Painting your house just helps so much to make it more personal and feel homey. I tend to do all of my house planning on my computer or iPad, but with paint colors, you really should do that with paint chips, as monitor lighting can change the look of a color drastically. But, since I'm so technology obsessed, I did a little of both. Knowing what colors I wanted to use, I checked out the Sherwin-Williams website and started picking out colors that I knew I wanted to use. 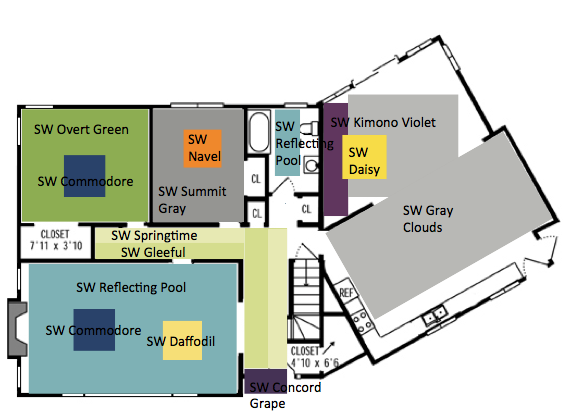 You have already seen the Family Room design plan, so you know that I picked those colors out a while back. Already having this room set, I knew that choosing the other colors for the first floor had to be done carefully, since the purple and the yellow are so bold. 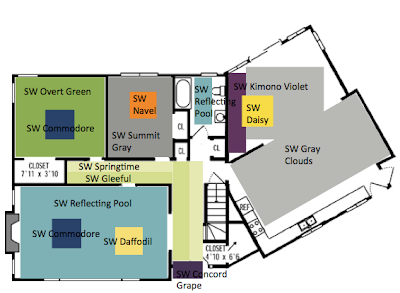 To make the color choices really easy to see, I decided to insert them onto the floor plan of the house. This is really helpful when choosing paint colors for your house, because you don't want all of the colors that you choose to end up clashing or looking terrible. There were some things that I already knew what color I wanted, so those were easy. I new that I wanted gray and orange in my craft room, which will be in the smaller bedroom. That was an easy choice. Next was the front door, and after seeing the picture below, I knew I had to have a deep purple door. 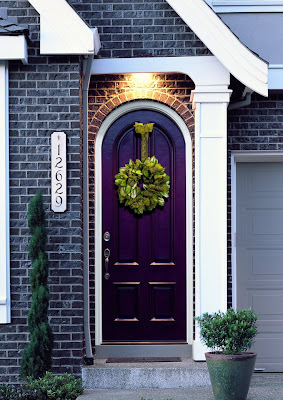 And the plus side of having a purple door is that it will match with the new paint on the exterior of the house, the new roof, and the stone work that is currently on the outside of the house. A common color that will be used throughout the house, in both furniture and paint, is white. Unfortunately, that doesn't help narrow down many color choices for us, so I thought about things that inspired me. 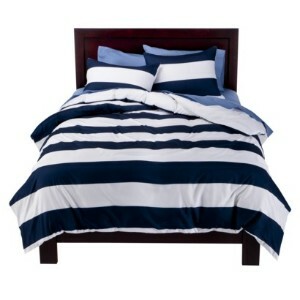 I found a navy blue duvet cover at Target while I was picking up the side table for the Family Room, and since it was on clearance, I bought it. This ended up becoming the inspiration piece for the navy blue, green, and white color palette in the bigger bedroom in the corner, which will end up being a guest bedroom. To match with the front door, I wanted a lighter contrasting color, so I decided to go with two different shades of green, and I have plans to do vertical stripes along both hallways above the chair molding and paneling. The full bathroom on this floor is almost entirely brown, which I think needs to change. So I chose a beautiful shade of teal that I think will complement the space and design perfectly. The last room on this floor was the Living Room. Since this space is so huge, we plan to use it as both a living area and a more formal dining area. I had originally picked out a light blue and a dark coral for this room, but after lining everything up on the floor plan, I realized that the coral color really clashed with the orange. So, after pulling some colors that I have already used in other rooms, I finally found the color palette for the entire first floor. I know there are a lot of colors there, but I'm not afraid of it being too much. I'm just so excited to start painting and decorating. I can't wait to actually be proud to show off our home! A few months back, I got a call at work from my mom, who was at home, and she said that the fire alarms had gone off three times so far that morning. Apparently when they decide to go off, they not only make that annoying and loud beeping noise, but there's also a woman's voice that starts saying "fire" over and over again. Except she doesn't say it like you and I would normally. She really emphasizes the second syllable, so it's more like "fi-YER." Kind of funny, actually. But anyways, the fire department came and checked everything out, and cleared the house, saying that there were no fire or carbon monoxide issues. The fire alarms didn't go off again... until my dad got home from work a few hours later. My dad did some investigating, and found that one of the smoke/carbon detectors seemed to be the one triggering the others, so he took it down, and that seemed to have stopped the problems. I called our electrician and he came over and took a look at the system and realized that not all of the detectors were linked into the same electrical system, which is apparently required for insurance purposes. Also, there were no detectors in any of the bedrooms, and some of them were battery operated. We ended up scheduling a time for him to rewire the fire alarms, and add in new ones where they were needed, and we hadn't had any issues since then. I was at work once again, so my mom and my sister did some investigating, and there was one that was triggering the others again. They disconnected it from the ceiling and the others haven't triggered on again, so it looks like we have another culprit. 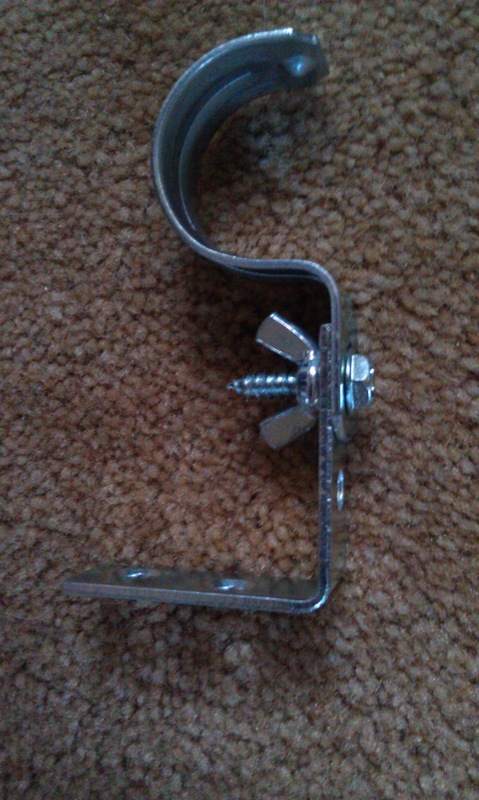 I'm going to have to buy a replacement at the hardware store this weekend to see if that solves some problems. Has anyone else experienced anything like this? Are we doing the right thing by unplugging the culprit? It just makes me nervous because it doesn't seem like those things should just go off without there being an issue, you know? Help! You've heard me mention a few times before that we have a great desire to renovate our kitchen. But, that's at least two years down the line, as there are other things that we would like to get done first. In the meantime, however, we want to do something that makes it look a little better and to personalize it a bit. The thing that I hate the most about our kitchen is the backsplash. 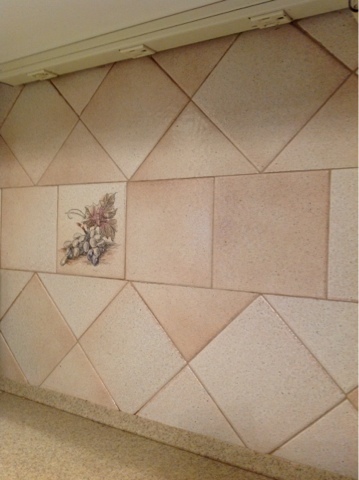 It's this really ugly peach colored ceramic tile that has a few printed tiles laid into the design. Some of them have wine bottles and grapes on them, and that is definitely not our style. I started researching cheap and easy alternatives to change this out, as we don't want something that will be too involved or expensive, as it will likely be changed again in a few years when we completely renovate the kitchen. I looked at a few different materials. The first one that I found was AirStone. AirStone is a product that is made from recycled materials, and is meant to look like actual stones. They come in a variety of sizes, and adhere to the surface that you want to place them on via an adhesive mortar. These look awesome, but for the amount that we would need, it would be just over $100, and while that is still really inexpensive, it was more than we wanted to spend. 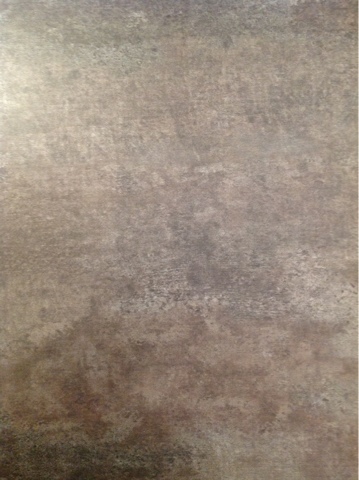 The second material that I looked at was Tin Ceiling Tiles, which are also adhesive. These come in great textures, colors, and patterns, but the price for a single tile was way more expensive than we wanted. Plus, I wasn't so sure about how good a shiny metal backsplash would look against a matte finish Corian countertop. The last material I found was vinyl floor tile. With the vinyl floor tile, you have the option of going with a solid color, or choosing one with dimension and different textures. Another benefit of the vinyl was that it was cheap, it was adhesive, like the other materials, and it didn't require additional caulking. With this in mind, we went over to Lowes this weekend and picked out a few different colors and patterns and bought sample tiles to bring home and test against the cabinets and countertops. The samples are actually real tiles, which you can purchase from as little as $.88 or as much as $2.25. We ended up coming home with 7 different tiles, and chose which one we were going to go with less than two minutes after leaning them up over the existing backsplash. The one that we ended up choosing was the most expensive one, of course. Everything that I like always ends up costing a million dollars, but in this case, we're still going to end up right where we wanted to be budget wise. 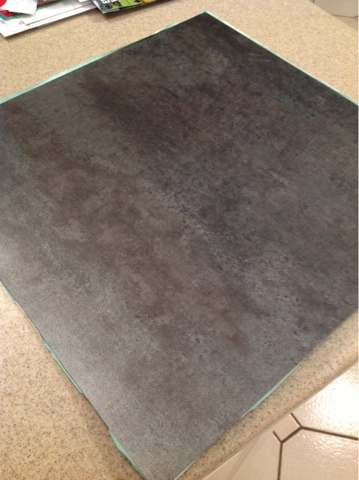 Even though these tiles are $2.25 each, they are 18"x18", instead of 12"x12", Which means that we won't need to buy as many cases and there will be much less cutting involved since the height of our backsplash is 18". So, you can see that the tile has a lot of gray, so it will go with the white cabinets and the stainless steel appliances, but it also has some tans and browns in it, so it will go with the countertops, too. 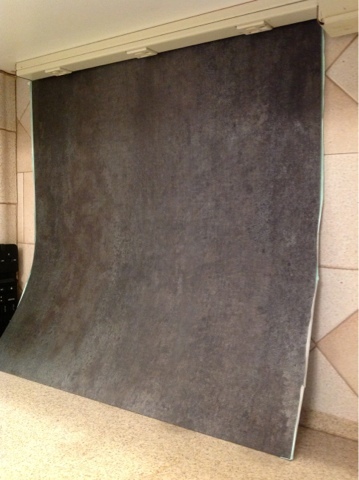 We have plans to paint this room this summer, so the gray that we have chosen for that will match as well. What do you think? Do you think this small change will make a drastic difference in our kitchen? I am so looking forward to doing this, and don't worry, I'll make you all a DIY!! 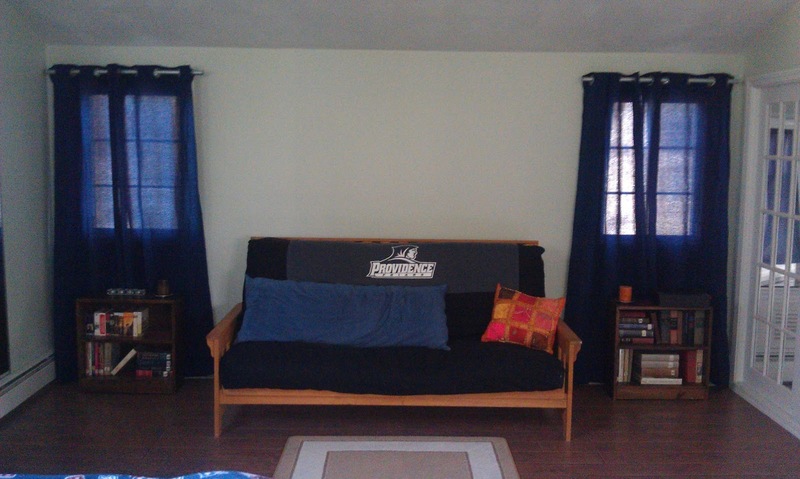 When D and I moved back to RI from Indiana, we sold our living room furniture, and trashed the 23+ year old couch and love seat that were gifted to us from D's parents. They had seen much better days! We were going to be living with them, and didn't need living room furniture, plus, most of the stuff was hand-me-down and mismatched anyways. 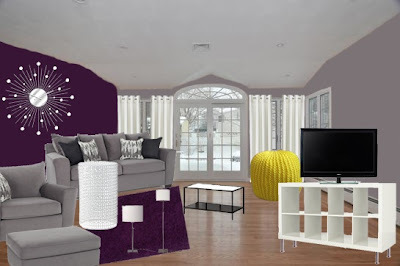 I recently sat down and started brainstorming how to furnish and decorate the Family Room, which will be the first priority when they move out. I am really inspired by The High Low Project, on HGTV, where the host, Sabrina Soto decorates a room with no budget, and then tries to recreate it for under the budget set by the homeowners, which is typically around $3-5K. Considering that we are starting with absolutely nothing, no couch, no chairs, and no TV, we are going to try to stay under $4K for the whole project. Here's what I've come up with so far! I fell in love with the Henry set from West Elm, but the three pieces that we wanted, the couch, oversized chair, and ottoman, would immediately be more than half the budget! After searching high and low for some modern looking gray living room furniture, I finally found a really nice looking set at a local furniture store, called Bob's Discount Furniture. What you need to know next is that I have an obsession with IKEA. It's bad, and I know it. Admitting that is the first step though, right? Anyways, this room wouldn't be complete without something from IKEA, and there will be plenty, but the first piece will be an Expedit. I know. Everyone has one. But, we're going to use it as a TV stand, and I'm going to hack it. I have plans to remove the middle divider on the top row so we have a place to put the TV receiver/DVR, and I also plan to add legs to it so that the TV is a little higher off the ground. 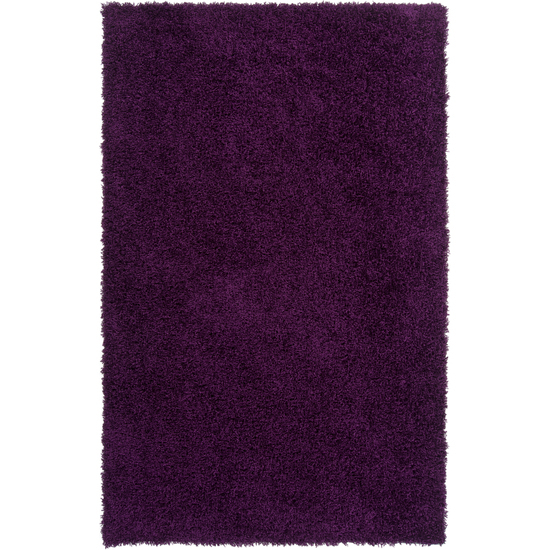 As I was searching for rugs, I came across this absolutely gorgeous and dark purple color, and immediately knew that I wanted that in the room. It's a high pile rug, which I am kind of concerned about with having cats, but I think it will be alright. You may have seen this pin on Pinterest, and I knew that I wanted to recreate that look. 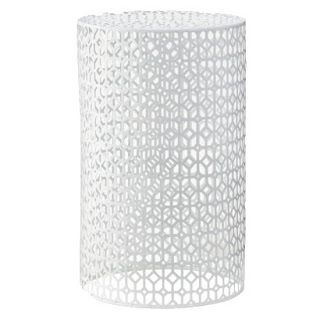 But, I searched and searched, and couldn't find any metal trash cans that were pretty enough to do this, so I started looking at actual side tables and found this one from Target! Later, after some research, I found out that the table in the inspiration picture is actually a table from Target and not a trash can, so I guess it was meant to be. I have plans to spray paint it our accent color - primary yellow! Lastly, a few DIY projects. 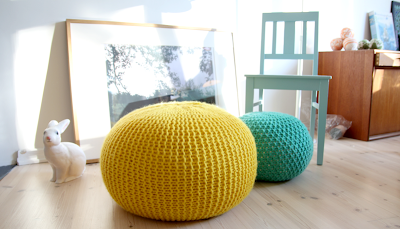 I love love love the look of poufs, but I really do not like the price tag at all. So, I'm going to DIY my own. It will also be primary yellow, although I am having a hard time finding thick enough and cheap enough yarn or something to make it from. I was recently thinking about how I could use rope, or even a bedsheet though. We'll see what I decide. 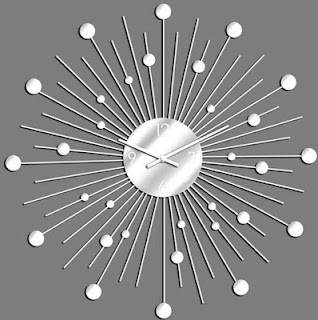 We currently have a 2' wall clock in the family room, but it's a much more traditional style, and we're looking for something a bit more modern. 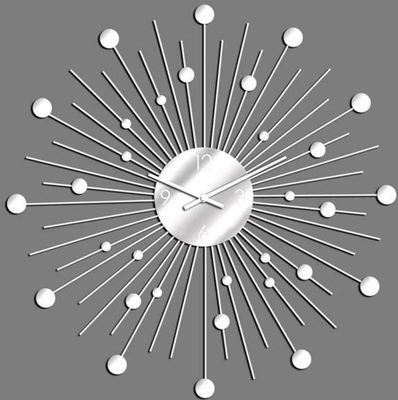 Without getting into the hundreds of dollars, we are going to DIY our own clock, which will end up being just over 3' in diameter. We're going to base it on this design, but make some modifications to it that we think would better fit our space. There are more pieces of furniture that we have chosen, and some accessories, but this is the plan for the most part. Also, for the DIY items, I'll be sure to write up the directions and do a post for each one. I'm really excited for the project! So excited, in fact, that I put everything into Photoshop to see how it would look together. I think it's looking awesome so far! I can't wait to actually get it started! What do you think? 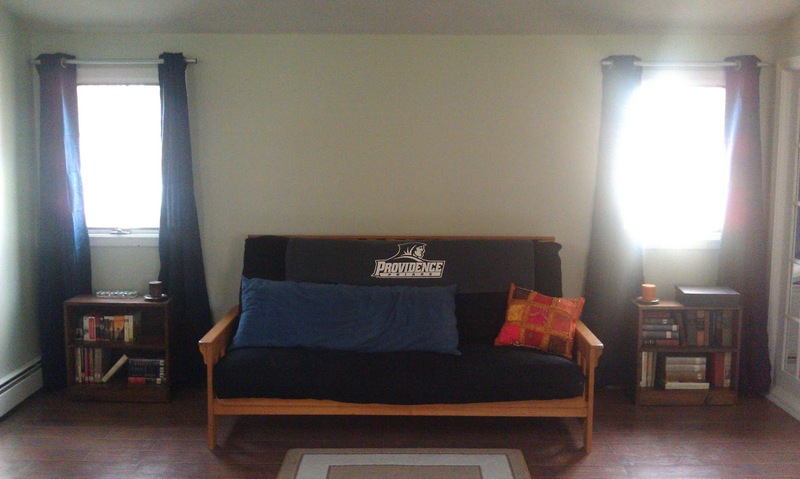 Now that you've seen the Master Bedroom in our house, you can tell that I had a major dilemma on my hands. There are four double-windows in the bedroom, one in the closet, and one in the bathroom plus the bay window above the hot tub. 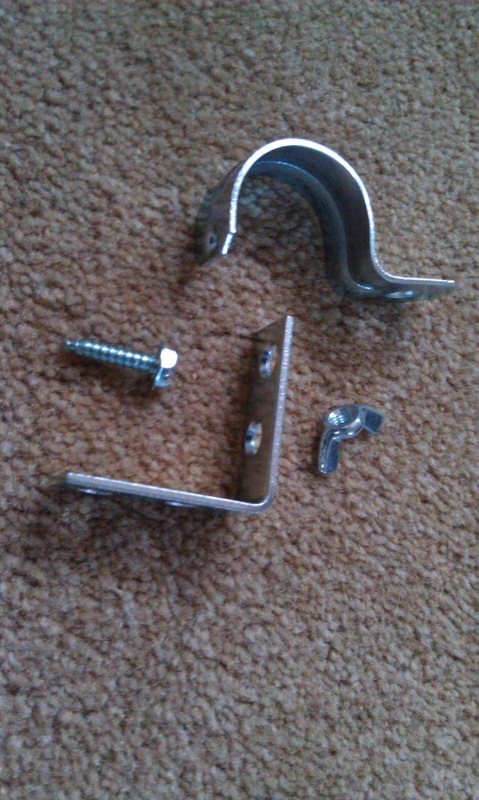 If you add all of those up, that means that I would need 9 curtain rods, and 18 brackets. 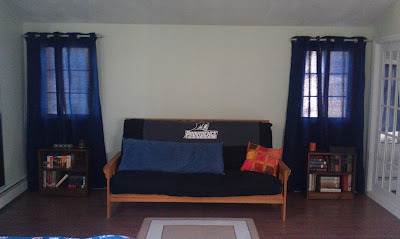 Curtains were a must, as we have neighbors that can see in the windows at night when the lights are on. Also, they make the room look nice! So, looking online, I quickly figured out that it was going to cost me well over $200 dollars just for curtain rods, and I was actually looking at more like $300 for the style that I wanted. Now, I'm a major DIY-er, so I immediately tried to come up with ideas as to how I could make this a cheap and fun project. So, I did some research and decided to make my own curtains AND brackets! I took a trip to Lowes with my dad, and borrowed my sister's SUV, and we bought the supplies. First, we went to the Electrical aisle, and took a look at the electrical conduit. It was going to work perfectly. 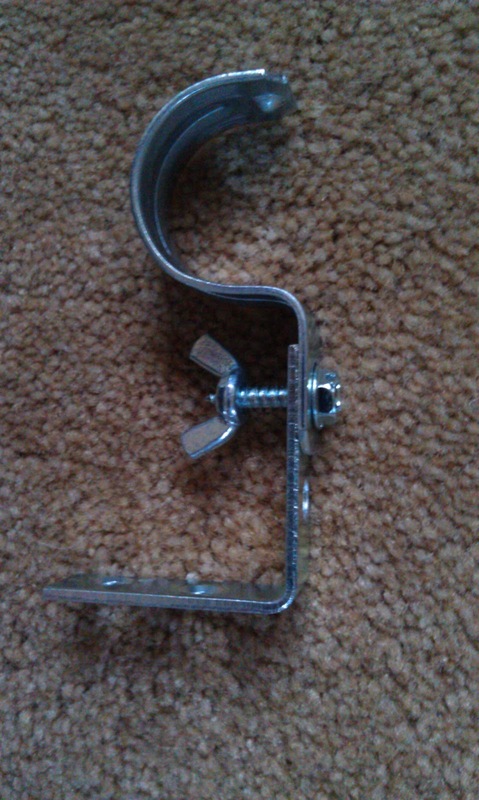 Now, you have some options in size when buying conduit for your curtain rods. They come in 1/2", 3/4" and 1" diameters. I ended up choosing the 1", which is slightly more expensive, but would look better with the size of the grommets in the curtains I was eyeing. 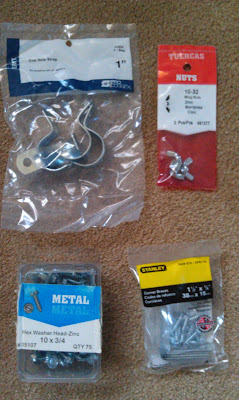 Next, we went to the pipe-fittings aisle, and I got all the parts for the brackets. 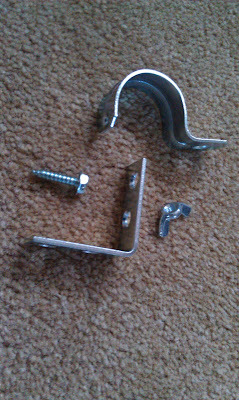 All I needed were conduit hooks (make sure you get the ones that are made for the diameter of conduit you chose). Lastly, was the hardware aisle, where I picked up some wing-nuts, some metal screws, and some "L" brackets. 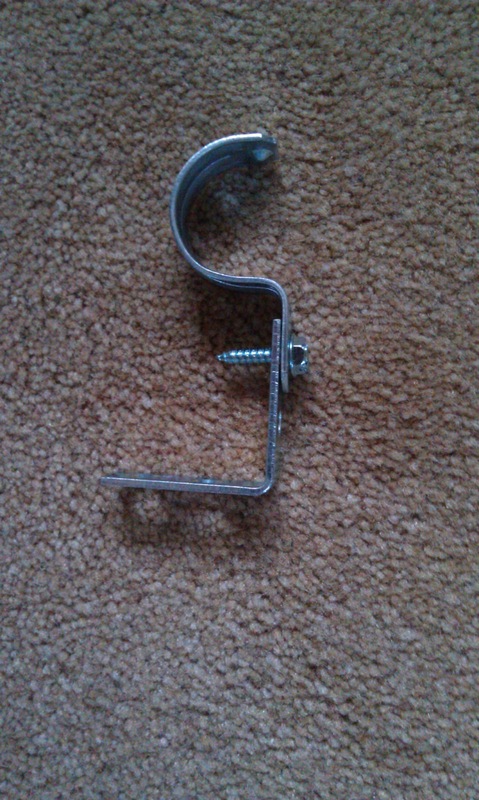 The "L" brackets should come with their own mounting screws. Make sure you keep those, because that's what you'll attach these to the wall with. Once we got home, it was assembly time! I started with the brackets. I got all my stuff together, and then got to work. Each bracket will be made of one of each of the items listed above. So, I took one of each item from my supplies, and started putting them together. 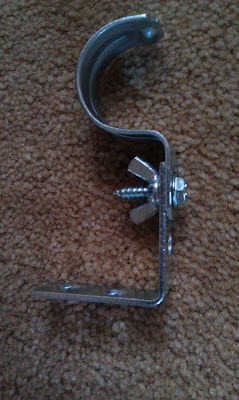 Take the conduit hook and line up the screw hole on the flat part with one of the screw holes on the end of the "L" bracket. 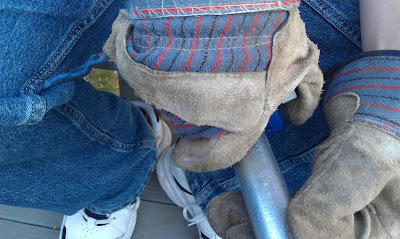 Put your screw through to hold them together. 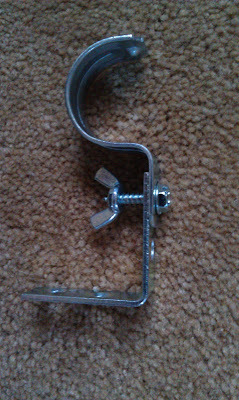 Attach your wing-nut to the other side of the screw and start winding it up to tighten the screw around the two pieces. You may want to use a pair of pliers to tighten the wing-nut as much as possible. And that's that! One bracket down and now 17 to go! Really quick though! Now, I'll show you the curtain rods. 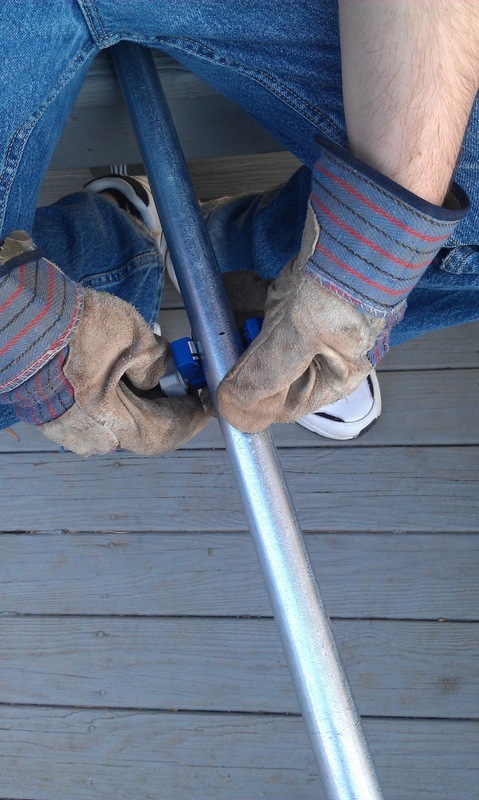 It makes it really easy to cut the pipe if you have the ability to anchor it down, so what D and I did was bring it outside, and lay it diagonally across two chairs, and then we each sat down on an end. We had measured out how long we needed the first part of the pipe to be for one of the windows, and I marked it with permanent marker. We took the conduit cutter, placed the blade on the mark, and started twisting around the pipe. 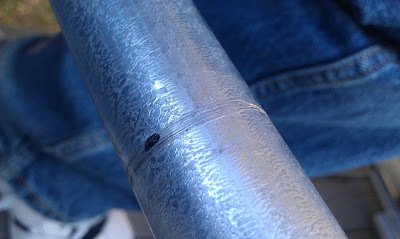 You can see how we stopped mid-cut so I could show you the indentation that the cutter was making. Depending on the brand, your cutter may tell you otherwise, but we tightened the blade after every rotation, and after less than two minutes, we had made our first clean cut. After we made all the cuts, we brought the pipes upstairs, made marks on the wall where we wanted the brackets to be, and screwed them into the wall using two screws from the "L" bracket package. I took the curtains that I bought and hemmed, looped them onto the pipes, and then clipped our electrical conduit curtain rods into place. These curtain rods will not have finials, as you may have noticed, but you can get creative and use just about anything as finials. We have plans to spray paint wooden balls and attach them to the end of ours, but you could also buy normal curtain finials and attach them, or even use grapevine balls, painted different colors (I actually plan to do this in another room in my house!). And now for the final reveal! Open curtains - with massive glare! So, the grand total for this project. Ready? Less than $80! Yes! For real! I spent less than $80 on everything I needed for this project. Totally awesome, especially considering I had 9 curtain rods and 18 brackets to make! Now, go out to your local hardware store and save yourself some money! Ok, so you've seen the first floor and the second floor of our house. Now it's time to see the last part, the basement and the yard. The basement was fully finished at one point, but as of right now, it is no longer. We purchased the house with knowledge that there were some mold issues in the basement because of a previous water issue, so we've had to do some work down there to get rid of the mold. The basement was high priority on our list when we first purchased the house, but it's kind of taken a back burner now. But, here we go! 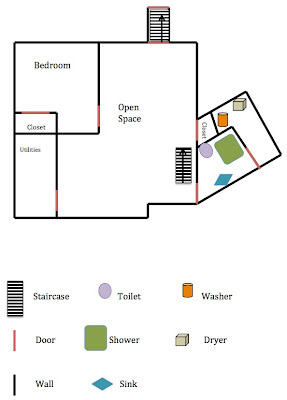 Like I did with the rest of the house, here is a floor plan of the basement. I didn't have Microsoft Visio with me at the time, so I used Microsoft Word and made a legend at the bottom that explains what each thing is. When you walk down the stairs to the basement from the hallway on the first floor, you come down into the open space in the basement. 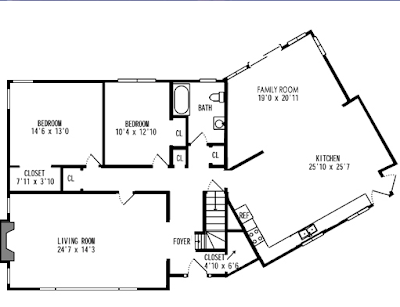 The area is really, really big, measuring at just about 700 square feet! There is an area closer to the utility room and there is also an area where there is a door that leads up a steep flight of stairs to the backyard. Behind the stairs that go up to the main floor, there is a closet, which is really oddly shaped, but has a bookshelf in it, in addition to the deeper storage space that actually runs underneath the staircase. You can see in the floor plan above that there is actually a bedroom down here too. The bedroom is a really good size, and just to give you an idea of it's placement, it is directly underneath the bigger bedroom on the first floor of the house. The bedroom even has a small walk-in closet, but the doors are currently removed for mold remediation. When the time comes, I'll paint them white to match the rest of the moulding and then hang them back up. Through the doorway next to the shower stall is the laundry room, which is actually a really good size. There is a folding table and a space for the washer and dryer. 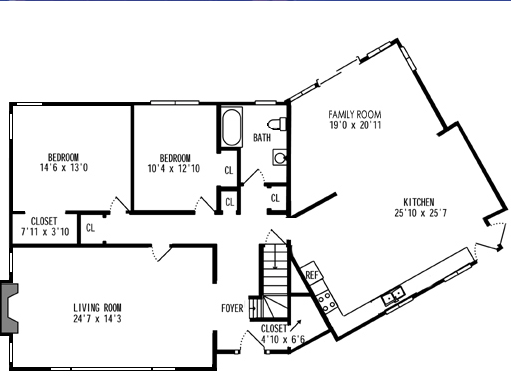 There are no appliances in the pictures below, but you can see in the floor plan above where they are currently located. 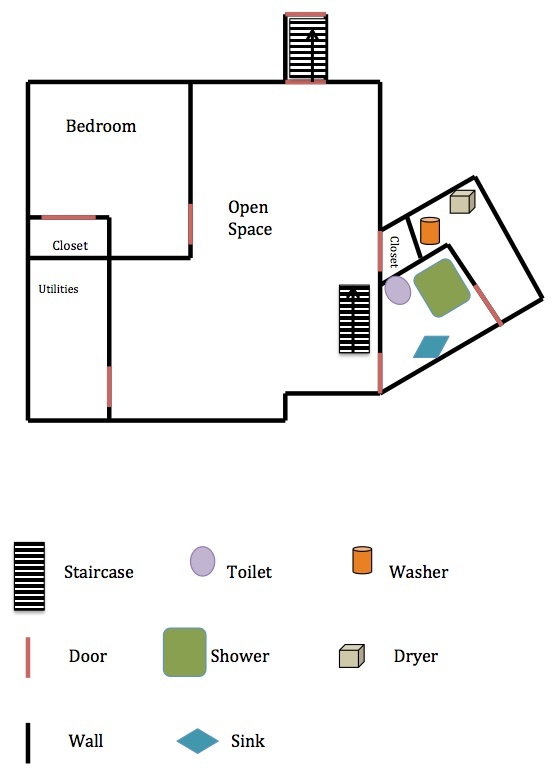 Eventually, we'd like to change the water line and electrical for the washer and dryer and get them closer to each other, but that's not absolutely necessary right now, so we're living with the current layout. And that's it for the basement. So, we'll move onto the back yard. 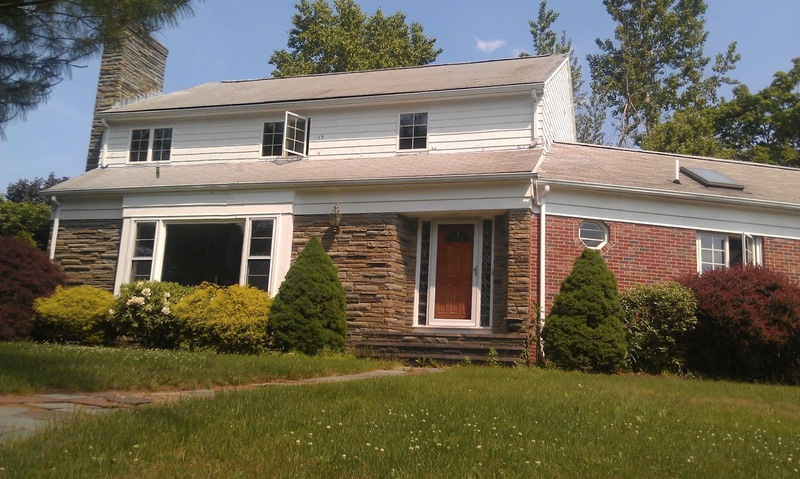 While the property is small, at just about 1/4 acre, it's the perfect size for us without being too much work. The backyard is so cute though. First, the door from the basement looks like this. Please keep in mind that the house has been completely repainted now, and that these pictures are from before we closed on the property. To the right of this picture is the small yard part of the backyard. The yard is completely fenced in, and has great arborvitaes along most of the fence for added privacy. You can tell from the last picture that I was standing on the deck, so now I'll show you what that looks like. The deck is really cute. It's not that high off the ground, which I like, and it has a built-in bench that goes around on two sides for additional seating. I think for safety's sake, we're going to build a back for the bench, and then I'll make some outdoor cushions for comfort. Now that the house is painted, we also have plans to paint the deck, as the two different shades of gray don't go together very well, and we want to brighten up the space a little bit. When standing on the deck and looking straight ahead into the yard, we have a non-fruit producing pear tree, which is absolutely gorgeous. This picture also shows two of the three additional Poplar trees growing along the fence, but we had all three of them removed because not only were they breaking the fence, but they were so tall and hanging over our back-neighbor's house, and we didn't want that liability. I can't wait to see this pear tree in bloom this Spring! I know that I have shown you some pictures of the front of the house before, but these show off a bit more of the landscaping, which will all likely be changed in the Spring. There are a lot of shrubs right along the house and not only are they not very attractive, but they also are too close to the siding and are causing problems, so we'll be taking care of that soon too. Some of these pictures were also taken before the house was painted and the roof was replaced, so please keep that in mind. This next picture is of the kitchen addition and front porch by the driveway. You can really see how overgrown the bushes and shrubs are along this part of the house. This next picture is of the corner of the original part of the house and the addition. Again, needs weeding badly, and some grooming overall. 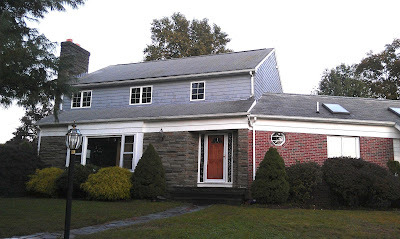 I know that the stone on the house looks very brown, but it's not actually that brown. When you look closer, there is a lot of gray, and some dark purples too, which is why we decided to go with a darker gray paint color for the wood siding. I actually really love the stone facade. And now for the front of the house. 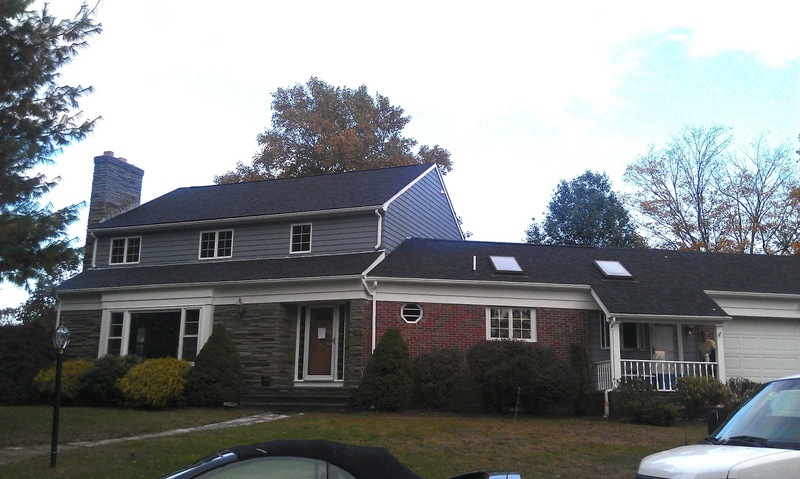 This first picture is before the painting and roof were done. During.... Painting done, roofing not. This concludes our house tour! What do you think? I am so glad that we decided to get the house painted and the roof redone. It makes it look so much better right off the bat. Now for all the other projects that we want to accomplish! The list never ends when you're a homeowner, right? !